You have two passions: the Detroit Tigers and your family! 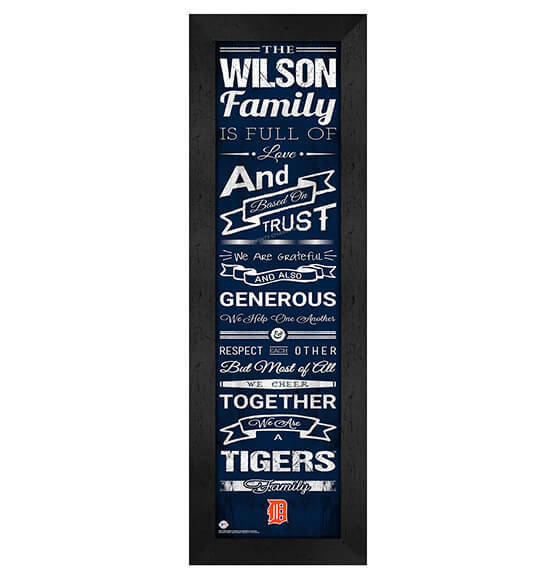 Our Personalized Family Cheer MLB Baseball Detroit Tigers wall art will show how much you love both, complete with vibrant team colors, the team logo and sweet family sayings worthy of hanging in a premier spot in your home. At PersonalizedThings by Exposures, we believe in celebrating life's memories and commemorating the parts of your life that spark joy. This festive MDF vinyl-wrapped frame, paper and glass wall decor will help you do just that! The perfect gift for the baseball lover in your life, this Detroit Tigers custom wall decor also includes a ready-to-hang sawtooth hanger for no-drama decorating.